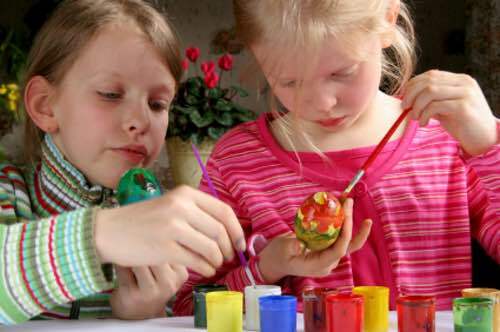 Knowing how to decorate Easter eggs is something that every child wants to learn. It's an ancient tradition that's still enjoyed by both adults and children alike. Most of all, it's fun to involve the entire family in coloring eggs the old fashioned way. 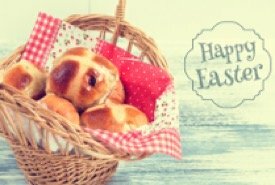 It's an easy, fun way to welcome the festival of Easter and celebrate family togetherness and love. 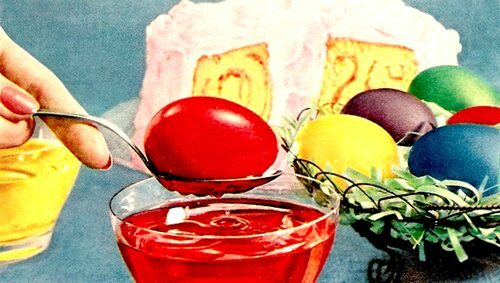 On this page, you'll find some vintage Easter egg decorating ideas to help you have a memorable time with your family. As for the mess, decide before you begin that you'll clean it up together and don't worry about it. Even the cleanup can be fun if it's handled right. It's all a necessary part of learning how to do a new handicraft. You can use fresh eggs. You can hard boil the eggs. You can blow an egg to remove its contents. How to choose? A decorated fresh egg will not last long and will create a mess if broken, a hard boiled egg lasts longer, but a blown egg that's decorated will last for years. That said, a hard boiled egg is much less fragile and easier for young kids to handle. Refrigerate your decorated eggs within 2 hours after they've been hard boiled. DO NOT EAT eggs that have been left out at room temperature for over 2 hours. If want your kids to use hard boiled eggs when learning how to decorate Easter eggs, then you'll need to plan ahead to avoid disappointment. Allow at least 90 minutes to boil and prepare the eggs. Be careful not to cook your eggs by placing them in already boiling water. The temperature difference makes it almost certain that the shells will crack. Instead, place the desired number of eggs into cold or lukewarm water and put the pot on the stove. The water should just cover the eggs. Adding a teaspoon of white vinegar to the water will allow the coloring to soak into the shell better, covering them more evenly and thoroughly, making the natural colors brighter. As the water heats, the inside of the egg heats gradually, hardening the contents. Edible eggs can be done in as little as five minutes. However, eggs meant for decorating should be given a few minutes extra, making them extra firm so they'll stand up well to handling. Don't overcook them since that can also lead to their shells cracking. Once the eggs are boiled, turn off the heat and allow the pot to cool gradually until both the water and eggs are at room temperature. This may take around 20 minutes. Now, remove the eggs carefully from the pot and place them gently into a bowl. Place the bowl into the refrigerator and let them cool and harden further for at least an 45 minutes. Then, remove the bowl from the refrigerator and let the eggs sit for about 10 minutes to reach room temperature again. Now they're ready for decorating. Learning how to decorate Easter eggs is made easier when the eggs are properly prepared. Blowing an egg to empty its contents without breaking the delicate shells is not the easiest of tasks, but it is fun, and it does get easier with a bit of practice. It's consistent with learning how to decorate Easter eggs the traditional way. To prepare for egg blowing, poke a small hole on one end of the egg and a slightly larger hole on the other end with a needle. Then, while holding the egg over a bowl, blow through the small hole, so that the contents can run out of the larger one. 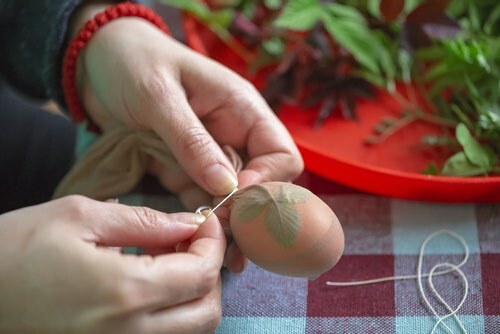 Before starting to blow, pierce the yolk with the needle to help things along and expect to blow harder to get the flow started. It's similar to blowing a balloon. You could end up with lots of mixed yolk and egg white depending on how many eggs you plan to decorate, so plan ahead to use the contents of the eggs to bake an Easter cake or Easter cookies or omelets or whatever else you would like to make. Once you've removed the contents of the eggs from the shells, gently rinse the shells thoroughly with clean water in preparation for Easter egg coloring. When the egg blowing is done and the shells have dried, have your children sit down to color and decorate the empty egg shells for Easter. 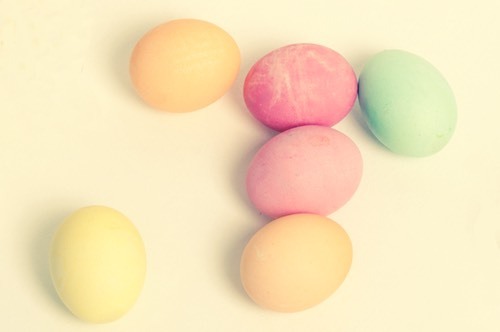 For shiny Easter eggs, rub them lightly with vegetable oil once the dye is dry. 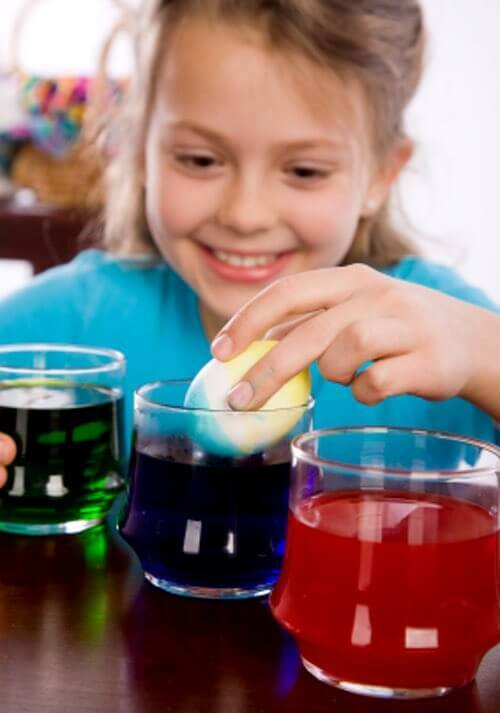 Making eggs a solid color with food coloring is easy and inexpensive. To prepare the coloring, just add about 25 drops of food coloring to 1/2 cup warm water, or enough water to cover the egg when placed in the cup. Place the egg into a the cup with the coloring and let it sit for a few minutes until it reaches the desired shade. Remove and allow to dry on a paper towel. 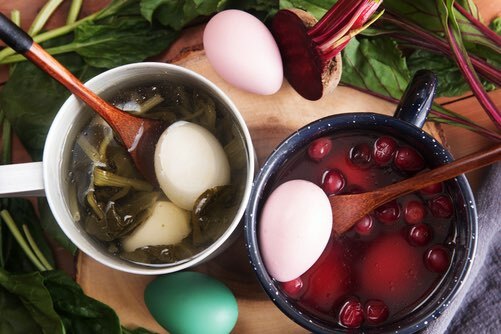 If you set the colored eggs on a cloth or tea towel to dry, don't expect to get it clean again in the washing machine, so use a paper towel instead. To make two-tone eggs, dip one end into one cup for a few minutes. Allow to dry, then dip the other end into a cup containing the second color. A three-tone egg can be had by simply dipping the ends in different colors leaving the middle of the egg white. Use wax crayons to write a name on the egg and then color as usual. After the coloring has dried, the crayon can be carefully wiped off if the eggs are warmed slightly in the oven leaving the name visible. Using stickers, rubber bands, or small bits of masking tape, you can mask off and apply several colors to a single egg. But, it can get tricky when you try to do more than three colors. Beyond that, hand painting with watercolors might be the way to go. One way to produce eggs with a unique marble effect is to mix a tiny bit of vegetable oil into the coloring. Then, the food dye sticks in a marbleized pattern to make outstanding looking Easter eggs. NEVER EAT EGGS once they are colored with a watercolor paint, as the non-edible paint will absorb into the egg itself. Easter egg painting with watercolor paint is one creative way to color the eggs with any design you want. The watercolor paints will soak into the shell well, and it may take several coats to get an even appearance, if that's desired. Use a fine watercolor brush or pens. Mom taught me Grandma's old fashioned method of how to decorate Easter eggs by using natural food dyes. 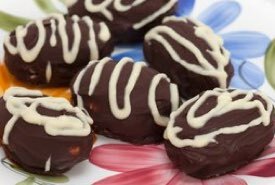 These Easter egg dye recipes are 100% safe, all-natural, non allergenic, inexpensive, and they really do work. Plus, it's fun and educational. Kids will discover that different fruits and vegetables produce different colors. The variety of pastel and vibrant colors will amaze. What's more, you can safely eat naturally dyed eggs that have been hard boiled and properly refrigerated! Add the chosen chopped vegetable or fruit to 3/4 cup water in a pot with 1/2 teaspoon white vinegar, bring to a boil and allow to simmer until the water turns a pleasing color. Remove from the heat, let cool, and then strain the colored water into a cup. Place a hard-boiled egg into the cup and let it sit in the colored liquid until it reaches the desired shade, this may take up to an hour. Pour 2 cups warm water in a small glass bowl, add and 2 teaspoons white vinegar, then stir in 3 tablespoons of the chosen spice. Place a hard-boiled egg into the bowl and let it sit until it reaches the desired shade. Pour 1 cup boiling water over 3 tea bags in a small pot and allow to steep for about 15 minutes. Pour the liquid into a small bowl, add 2 teaspoons of white vinegar and let cool. Let a hard-boiled egg sit in the tea-colored liquid until it reaches the desired shade of color, this may take up to an hour. Different teas will produce different shades. Prepare 1 cup of strong coffee, add 2 teaspoons white vinegar and let cool. 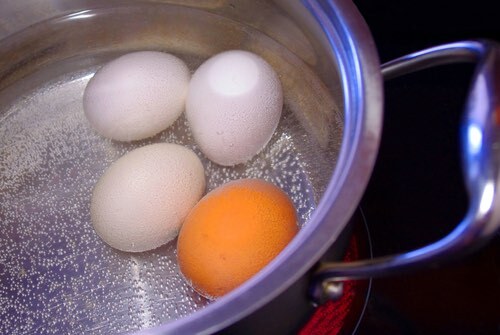 Let hard-boiled egg sit in the coffee liquid until it reaches the desired shade of color, this may take up to an hour. Learning how to decorate Easter eggs the old fashioned way by using an onion skin is something everyone should try. Prepare to be amazed at the beautiful results you'll achieve! Remove the red or yellow-brown outer skin from an onion and wrap it around a raw egg securing it by wrapping with twine, string, or thread. Gently hard boil the egg WITHOUT vinegar and afterwards remove the onion skin to reveal a golden-toned, multicolored egg as pictured above. Note: Red cabbage leaves can be used in the same manner as onion skins. Enjoy an outdoor walk with your family and collect leaves and flowers that are small enough to lay on the surface of an egg. Then, cut some old pantyhose into 5-inch strips. Dip the hard boiled egg in water to dampen it, then carefully position a leaf or flower on its surface. Several leaves or flowers can be arranged in a pattern if desired. Place the egg on a piece of old pantyhose and pull the material tightly while keeping everything in place, then secure it with a piece of string. 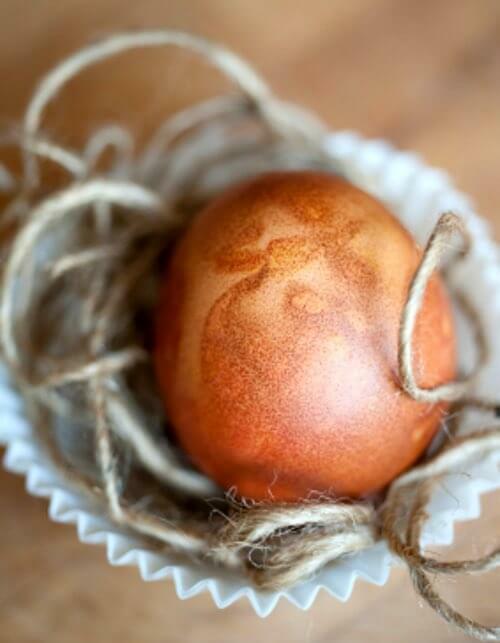 Now, you can naturally color the egg using dyes prepared from vegetables and fruits. The results are unique and often exquisitely detailed. 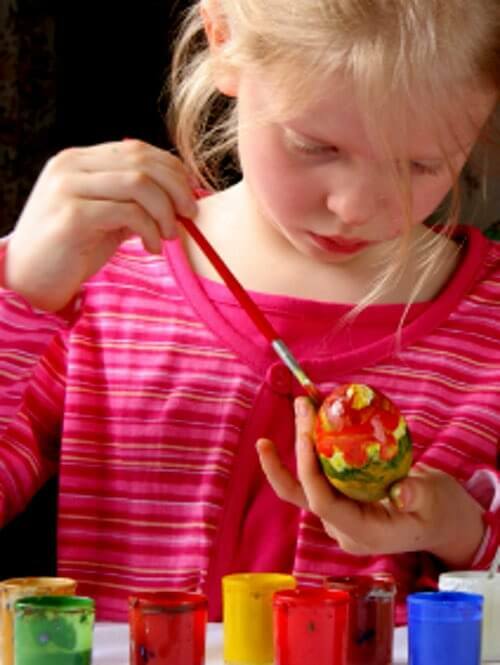 Easter egg dye kits offer a very convenient way to decorate your eggs. Most kits for children contain a simple wire egg holder, multiple dye colors, stencils, adhesive stickers, and other decorating aids. 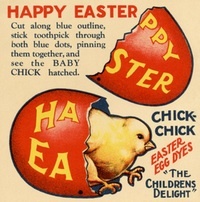 Instructions on how to decorate Easter eggs are often in the kit. You can find them available for sale at most local stores around Easter time. Although egg decorating kits started to become popular back in the 1950s when I was a child, I had MORE fun experimenting with the old fashioned methods of decorating Easter eggs with onion skins and colors made with homemade Easter egg dye recipes. If your kids enjoy experimenting, and most do, then you'll find that they'll love the old fashioned methods too. It seemed almost magical when such unique colors were produced from ordinary foods found in the kitchen. Give them ribbons, watercolor paints, crayons, food dyes, and felt pens and let their creativity run wild. You'll find that there is far more joy in decorating Easter eggs Grandma's way than in purchasing ready-made decorations at the local craft store. Your children's Easter egg decorations can be proudly displayed in small baskets, or narrow strips of colored paper can be decorated and their ends taped together in a ring to form attractive Easter egg holders. Learning how to decorate Easter eggs will become a fond memory of their childhood to share in turn with their own children. This vintage Baby Chick Easter Toy was a little novelty item that was once found inside packages of Chick Chick Easter Egg Dyes. Click the button above to download it FREE in PDF format to print out on your color printer for the grandchildren to experience and enjoy.